Tanggula Mountains are a mountain range in the central part of the Tibetan Plateau.Administratvely, the western part of the range is in Nagqu Prefecture of the Tibet Autonomous Region; the highest, central part, in the border area of Nagqu Prefecture and Tanggula Town of the Qinghai Province; and the eastern section, in the border area of Nagqu and the Yushu Tibetan Autonomous Prefecture of Qinghai.The elevations of the main ridge average more than 5,000 m (16,404 ft). The Yangtze River originates in this mountain range and Peak Geladandong (at 6,621 metres/21,722 feet, located within Tanggula Town) is the tallest peak in the range.The Qinghai-Tibet Highway and the Qinghai-Tibet Railway cross the Tanggula Mountains at Tanggula Mountain Pass. 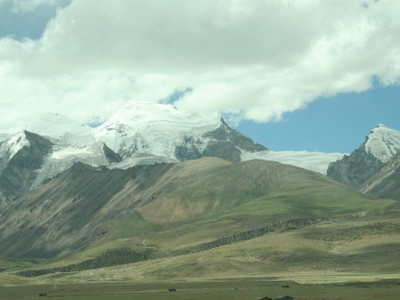 This is the highest point of the Qinghai-Tibet Railway, and the highest point of any railway in the World, at 5,072 metres (16,640 feet) above sea level.On account of the snow and occasional road accidents, highway closures and concomitant traffic delays are not uncommon.The mountains lie within the Tibetan Plateau alpine shrub and meadows ecoregion.The Tanggula (Tanglha) Range is a dividing range between the basin of the Yangtze River in the north and the endorheic basins of north-eastern Tibet in the south. This range should not be confused with the Nyenchen Tanglha Mountains located a few hundreds kilometers further south, separating those endorheic basins from the Yarlung Tsangpo (Brahmaputra) River basin of southern Tibet. 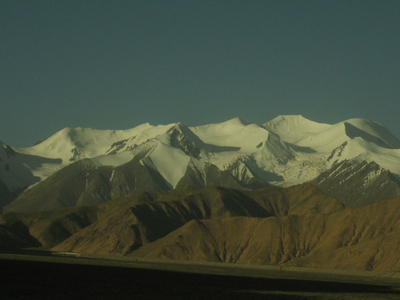 Here's the our members favorite photos of "Mountain Ranges in Qinghai". Upload your photo of Tanggula Mountains!